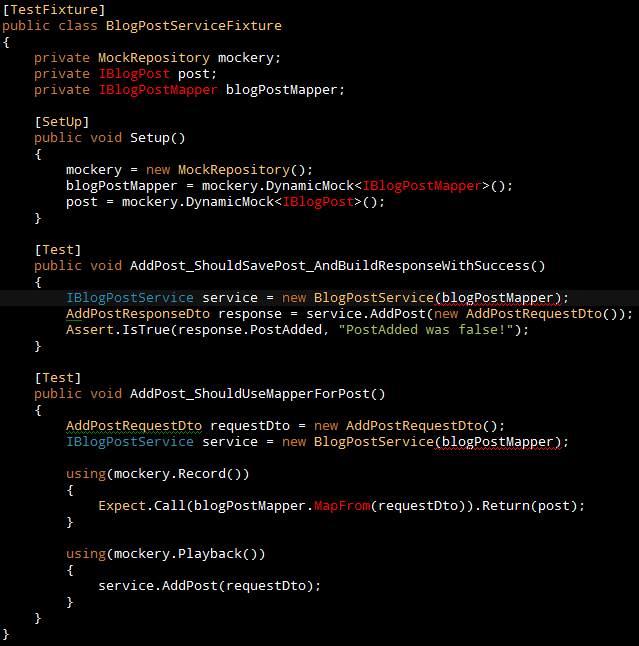 We finished up in part five with a full suite of passing tests and our BlogPostService is slowly taking shape now. The next few posts will introduce persistence and validation but before we get started on these features, we have a little housekeeping to perform on our existing code. First step is to build the Castle trunk and update our references to the latest versions. Secondly, we’ll incorporate a few changes suggested by Hammett. I’m noticing a little duplication creeping in to our integration tests that should be removed. Also, until now we’ve had to assume that a web server is running on a specific port on our development machine in order to run the integration tests. Through a little tweaking we can spin-up a temporary server in our test fixture setup code and host our test code there instead. You can see our tests now call BuildTestUrl to determine the full URL where we’re hosting the development server. Neat. I’m sure when we add further integration fixtures we’ll extract class this, but for now we have a nice working set of tests and should remember the principle of YAGNI! I’m going to cut this installment short here. 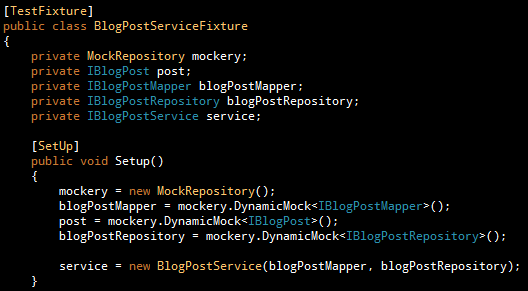 In the next post we’ll get back into the swing of it and continue implementing features. Rob Conery has been posting a series of screencasts featuring the development of an ASP.NET MVC based product catalogue. 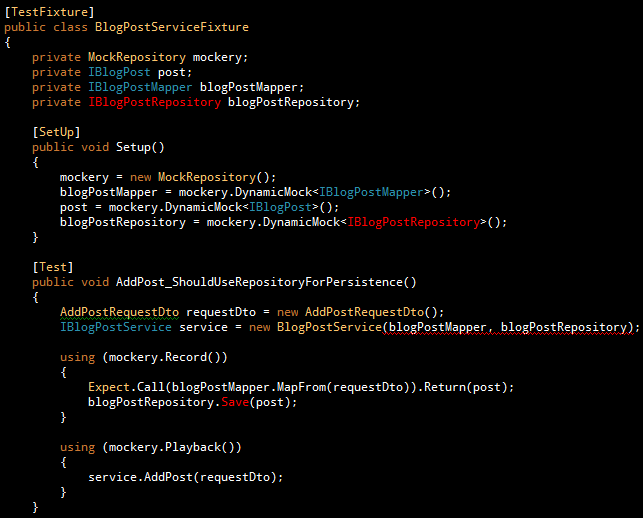 This is being carried out in a “TDD” like fashion. The interesting difference between his posts and mine (apart from the obvious fact that I’m lazy and haven’t screencasted… yet) is that he starts from the bottom of the stack and works upwards towards the UI where as I do the opposite. Its interesting contrasting the two approaches not to mention the differences between the ASP.NET MVC framework and Castle Monorail way of getting things done. Make the DTO’s properties virtual so we can mock them. This is in preference to extracting an interface. Add the necessary properties to the IBlogPost interface. Our full suite is passing now. Not bad for 5 minutes work! As usual the latest changes are checked in to the Google code project hosted here. Now we have a full passing suite, in our next edition I’ll be moving down into the persistence and also incorporating a few modifications from Hammett. Stay tuned! 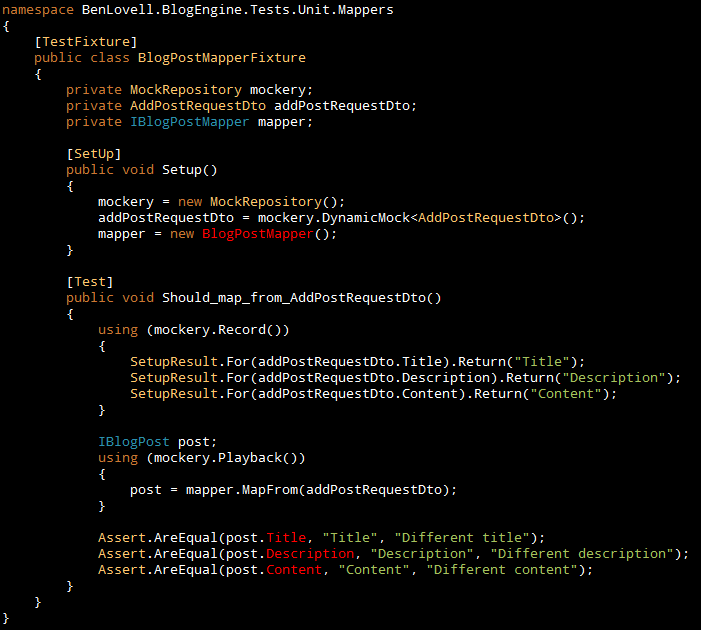 Map from the AddPostRequestDto to our actual BlogPost aggregate root. 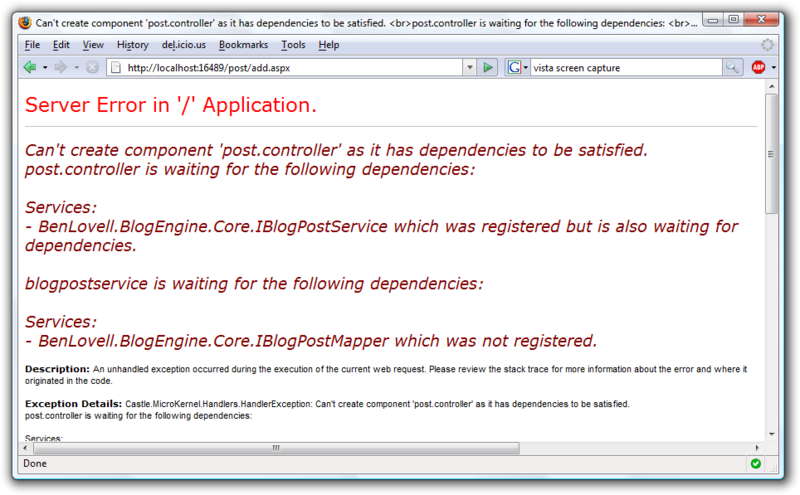 The integration test is failing as we’ve yet to wire up the BlogPostService dependencies in the container. Before we can do this we need to drive out the interfaces we’ve introduced. We’ll do that in the next post. That’s it for this post. I’ve checked in the latest changes to the repository. In the next post we’ll continue our efforts and begin to implement validation on our screen-bound DTO’s. 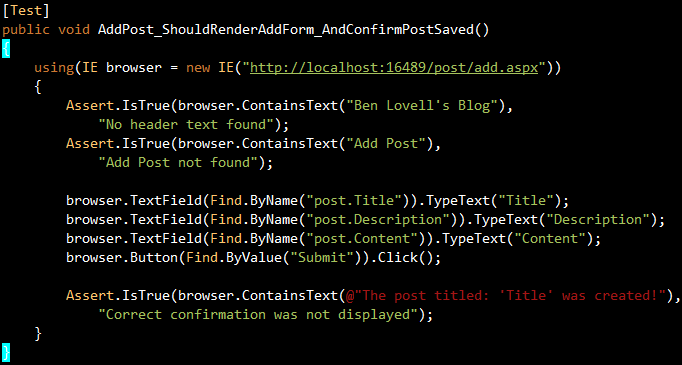 We’re faced with a bunch of unimplemented types and members shown in red thanks to Resharper’s error highlighting. As you can see from the test we’ve introduced the AddPostRequestDto and the three properties it exposes. 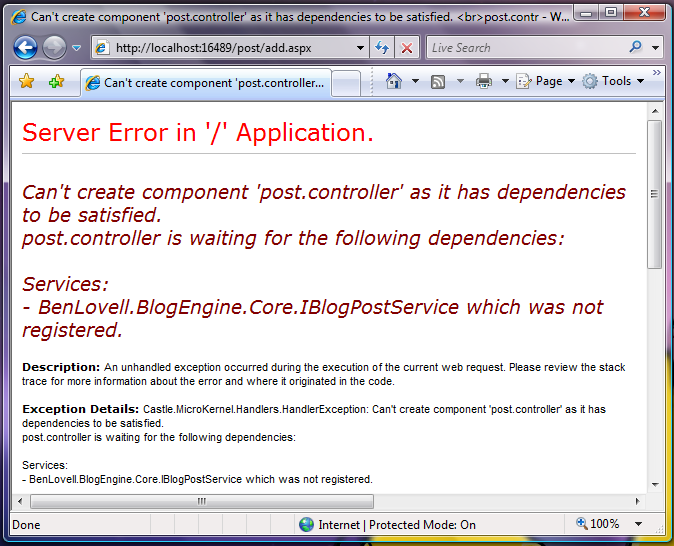 Secondly we’ve introduced the Save action to the PostController that accepts our AddPostRequestDto. Our test then simply asserts that the correct response was set and that the postcreated view is displayed. 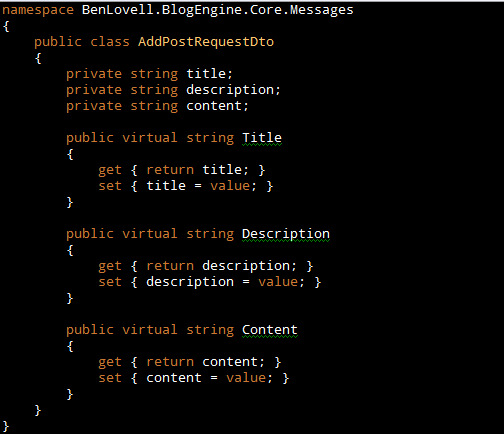 We’ve added this new type to the Core project under a new Messages namespace and folder for organisation. Our next task is to actually step down a layer and introduce a service to handle our persistence. I’ve checked in the latest changes. Stay tuned for the next post. This is the first of a series of posts I’m penning where I’ll be incrementally developing a basic blog engine running on the Castle trunk and developed wholly test first. Each new feature or addition will be described by simple narrative, followed by some testing/coding from the UI (or controller in this case) down to the database. I’ll be using much of the Castle stack goodness including Monorail, Windsor and ActiveRecord. Unit testing with Mbunit and acceptance testing with Watin. My aim with this series of posts is to demonstrate the power of the Castle stack, combined with TDD and the slow, incremental addition of features. After each post I’ll check in my latest changes which will after a clean build will result in a fully working system. As you can see from the right, our solution consists of three projects. The core project will hold our domain model, interfaces, services and application code. There is a test project for both our unit tests and acceptance tests, and finally we have the web application project holding our controllers, views and static content. I’ve put together a basic layout and stylesheet that serve our needs for now. This will be added to as our blog engine matures. 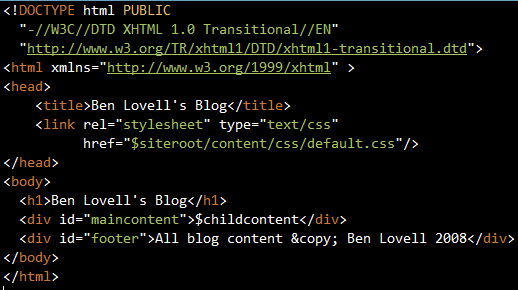 Although we have no concrete examples as yet, the controllers, services, facilities and configuration properties are configured through Windsor XML configuration files in the web project. We’re running on a Castle build I ran locally after checking out the trunk some point over the last couple of days. It will be interesting to see how our initial design adapts as required when features are piled on during the later stages of development. I’ve not got any specific plans on how long this series will go on for although I am considering moving my blog away from WordPress and will most likely host under the very blog engine I’ll be creating. Good times! Anyway enough of this, lets move on to the first iteration. 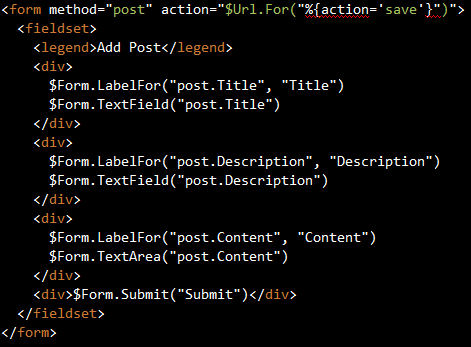 For this iteration we will build our first cut at the blog post authoring screen. This comprises a very basic form allowing the author to specify the title, short description and full content of the post. I think you’ll agree that what we’re building in this iteration won’t serve as a fully powered blog engine any time soon, but lets restate our initial aim here: to incrementally build and adapt our system as new requirements and features emerge. With that said, lets get on to building our first feature! The controller has no associated layout. We’ve yet to create the requisite view: Add.vm. 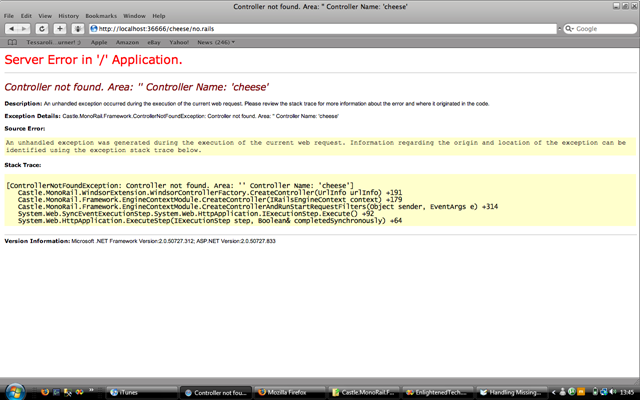 We’ve not added the Windsor XML configuration for our controller. A few things have changed here: we’ve altered the naming of the test to clarify intent, and as mentioned previously our test will enter some values into our form fields and submit the form. Our last assertion is checking that the correct confirmation message is displayed. Now we could argue that the setting of the description and content is superfluous in this test as the outcomes aren’t asserted. But, the effort required to implement those fields is minimal and highly unlikely to impact on any existing code/tests (i.e. none!). It fails as we have yet to create the save action on the controller, and also the nonexistent action doesn’t display the required confirmation… For obvious reasons. At this stage I’m going to wrap this up for now. Part two will follow over the next couple of days. Stay tuned! An interesting discussion was brought up in one of the ALT.NET groups regarding the use of DTO’s in the presentation layer that I had to chime in on. 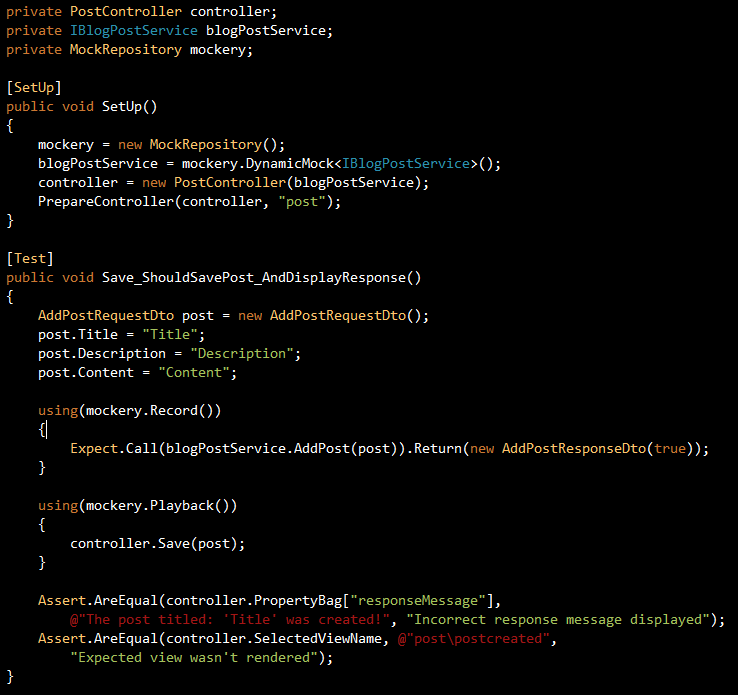 Test driving from the top-down is my favoured approach when developing web applications. I’ll start by writing a failing test for my controller (you should know by now I use Monorail ;)). Then I’ll stub out any dependencies, these usually being service interfaces which accept and return simple DTO’s with absolutely no behaviour. Stubbing out the services allows you to return dummy data very early on in your development. The nice thing about this approach is you can get a working UI together very quickly and then drive out the development of each layer until you hit your domain model. From which point you can then wire-up your real service and repository implementations and satisfy your acceptance tests end-to-end. Now I’m not suggesting that this approach isn’t possible without DTO’s but it makes it a heck lot easier in my experience. DDD aggregates by their very nature are composed of behaviours you don’t want to pass into your UI. 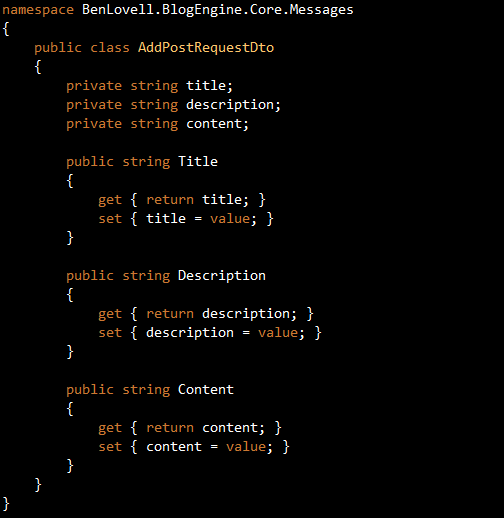 Using DTO’s for binding into your UI keeps things nice and lightweight. Cohesion is high as the DTO’s are created for a very specific purpose, usually to satisfy a particular screen or UI workflow. I’ve always thought (and I read this somewhere I think, but can’t remember where) that a sign of a well designed architecture, among other things of course, is the ability to replace the UI and have everything function correctly. Now it was probably more poetic than that but essentially what this means is your UI should have absolutely zero dependencies on anything below your service interfaces. Using DTO’s and message passing means the only work your controllers are doing is scraping the request, passing your message to a service and binding the response. I’ve demonstrated this in systems I’ve developed by providing an API (which can be considered another UI if you squint a little and look sideways) which is comprised of exactly the same service calls and DTO’s my web UI is using. So in summary you can see I’m a big fan of the domain model in my services, mapping to and from DTO’s in my UI. What is your favoured approach? 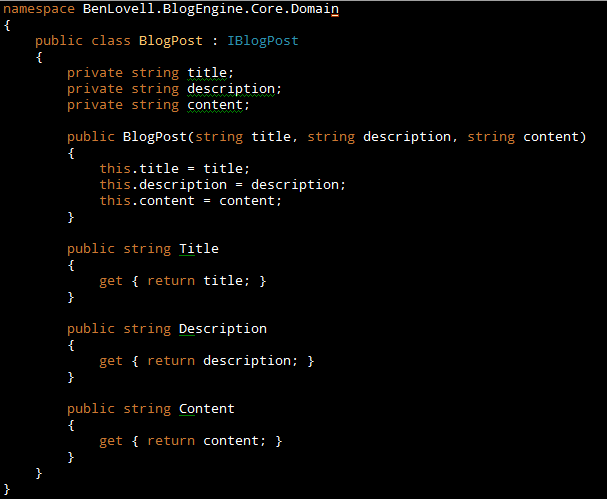 My plan is to build a basic blogging engine using Castle Monorail, Windsor, ActiveRecord and developed with DDD & TDD. I’ll screencast the whole procedure from start to finish, outlining the basic story or stories for each screencast episode and then go ahead and implement those stories. Due to the (potential) size of this I’ll no doubt split this up over many screencasts – probably weighing in at around an hour or so per piece. Production values will be conspicuously low of course and the screencasts are not necessarily meant to serve as an educational tool, more a window into my usage of tools & techniques. Monorail provides us with the concept of a rescue to handle exceptional circumstances that might occur when processing a request. 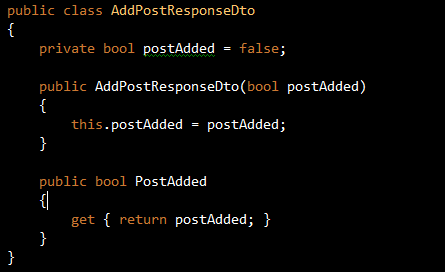 Rescues can be attached to specific exception types by specifying particular attributes on your controllers. Rather than go into that in this post I’d recommend you take a look here. Luckily, Monorail provides an explicit rescue for these circumstances. All you need to do to enable this is add a 404.vm or 404.brail to the /views/rescues directory depending on your choice of view engine. Some of you may be aware of the ALT.net conference going on this weekend. I wasn’t particularly interested in a gathering of egos in mutual back-slapping, but I was interested in the announcement of the System.Web.MVC framework from Microsoft. Jeffrey Palermo announced some of the technical details in this blog post, although light in actual substance, yet giving us more idea than anything released previously. Testability: the key concern. Overcome by making everything virtual/behind interfaces and extension points abound. Ability to plug-in to framework via aforementioned extension points. Gives us the ability to add extra view-engines a la Monorail. Default view-engine implementation using ASPX without postback and viewstate pain. Controllers can be resolved from a container i.e. Windsor, Spring.net etc. A CTP is due towards the end of the year (Monorail will suffice just fine until, and probably far after then) and the framework is slated for release with VS2008 as an add-on to the general release. Handling devices, i.e. sniffing user agent and providing different views. Something just recently provided in patch form to Monorail. The MSMVC equivalent of Monorail’s ViewComponent concept. Routing and URL rewriting support. Monorail provides a handy means of binding parameters to controllers from several different sources including: querystring, posted items etc via the DataBind attribute. However, if you’re attempting to bind an entity with associations you’ll quickly find that the associations aren’t loaded as part of the usual binding process.